AggSub is a subgradient based solver for unconstrained nonsmooth DC (difference of two convex functions) optimization. The method consists of inner and outer iterations. In inner iterations null steps are carried out to find search directions. At each step of the inner iterations only two subgradients are used to calculate search directions: the aggregate subgradient and the subgradient calculated using the current direction. In outer iterations either serious steps are performed to move into a point with lower value of the objective or the parameters of the method are updated. It is proved that limit points of the sequence generated by the AggSub are critical points of the objective and the number of null steps in the inner iterations is finite. The software is free for academic teaching and research purposes but I ask you to refer the reference given below if you use it. To use the software modify tsubgdc.f95 and functions.f95 as needed. The code (Fortran95) is implemented by Kaisa Joki. If you have any questions conserning the implemetation, please contact her directly. - Main program for AggSub. A. Bagirov, S. Taheri, K. Joki, N. Karmitsa, M.M. 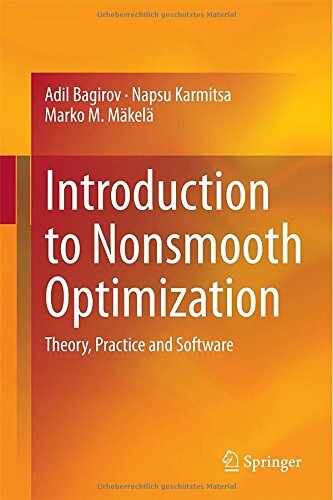 Mäkelä, "Aggregate subgradient method for nonsmooth DC optimization", submitted, 2019. A. Bagirov, S. Taheri, K. Joki, N. Karmitsa, M.M. Mäkelä, "A new subgradient based method for nonsmooth DC programming", TUCS Technical Report, No. 1201, Turku Centre for Computer Science, Turku, 2019. The work was financially supported by the Australian Research Counsil’s Discovery Projects funding scheme (Project No. DP190100580), Academy of Finland (Project No. 289500, 313266), and University of Turku.